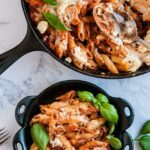 This comforting skillet baked ziti is the perfect pasta recipe to serve to company or gift to a friend in need of a little extra love. Cook the pasta according to the directions on the package and set aside. While preparing the pasta, heat a large cast iron skillet over medium heat. Add the ground beef to the hot skillet. Season with pressed garlic, a pinch of salt, pepper, and red pepper flakes. Cook until brown all the way through, about 10 minutes. Pour in the tomato puree. Bring to a slow simmer and sprinkle in the basil. Continue to simmer while you assemble the cheese. In a medium bowl, mix together the ricotta, tablespoon of olive oil, Parmesan cheese, lemon zest, garlic powder, and salt and pepper. Set aside. Stir the pasta water into the sauce. Spoon the cooked pasta into the meat sauce and stir until mixed. Stir in half of the shredded mozzarella or Italian cheese blend until evenly distributed. Spoon the ricotta mixture into the noodles, distributing spoonfuls of the ricotta throughout the skillet without over mixing. Top the skillet contents with the remaining shredded cheese. Loosely cover with aluminum foil and bake at 350 for 15 minutes or refrigerate to bake later. If baking later, bake at 350 for 30-40 minutes or until the contents of the skillet are warmed through and the cheese is melted and bubbly.